If you have a problem with your water line, you need a professional right away – someone who can quickly and properly fix the problem and stop whatever caused it in the first place. The Warminster area water line experts at Resolve Trenchless have the skills and tools needed for any water line issue. The water line coming into your home is absolutely critical to your daily life and to your overall health. 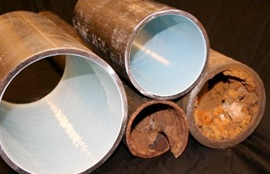 When you start to have issues with your water line make sure that you call Resolve Trenchless. Here are a few of the warning signs that could mean you need trenchless water line replacement. -Sudden increase in water bill – Keep a close eye on your water bill. If you notice any sudden and unexplained increase in usage it could mean that you have a leak somewhere in your water line. The leak could start out small and gradually increase or it could spring suddenly and become very large quickly. That’s why you should call the Warminster dig free water line replacement professionals at Resolve Trenchless. -Damp puddles or soggy patches – If you notice that your foundation is wet, if there are soggy patches of ground around your home, damp carpets or wood floors; it could mean that there is a water leak around your home. – Cracked Foundation - Another common indication of water leaks is a cracked foundation. If your foundation is cracked it usually means that you have a leak somewhere under your slab that is compromising its integrity. The Warminster trenchless water line replacement technicians can get your pipe replaced as quickly as possible.